Jakarta. 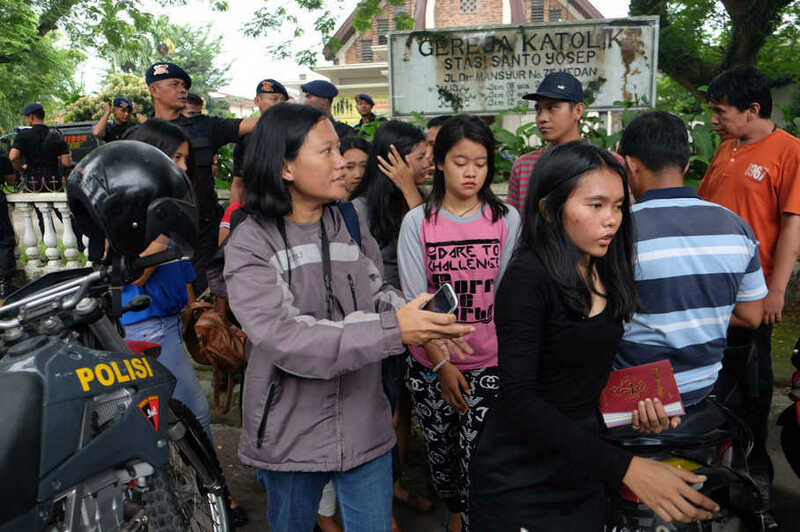 A suicide bomb attempt at a Catholic church in Medan, North Sumatra, Sunday morning (28/08) has left the suspect with minor injuries after the bomb failed to detonate correctly. Father Albert S. Pandingan was leading the Sunday service at Medan’s St. Yoseph church when the suspect, identified as I.A.H., ran towards to pulpit and attempted to stab the priest. The bomb hidden in the suspect’s vest failed to detonate, only creating sparks which injured the would-be attacker. The priest sustained only minor scratches to his arm. I.A.H. is a 17-year-old student from Setia Budi in Medan Selayang, North Sumatra. Members of the church congregation seized the suspect, who was carrying a knife, an axe and a pipe bomb in his backpack, before police arrived to clear and secure the venue. “We have seized a back backpack from the perpetrator. The perpetrator is alive and injured and there are no casualties in this incident,” National Police spokesman Insp. Gen. Boy Rafli Amar told Beritasatu. Boy also said police had found what a drawing that resembles the Islamic State flag. It remains unclear if the suspect is affiliated with a terror cell and police are investigating potential links. In early July, a day before Idul Fitri celebrations, a suicide bomber targeted the Solo police headquarters but killed only himself. Medan. The young failed suicide bomber in Sunday’s (28/08) Medan terror attack is believed to have met an identified man on the street prior to the event, preliminary investigations have found. “We are still interrogating the suspect. He said someone he met on the street asked him to launched the attack,” Medan Police Chief Comr. Mardiaz Khusin Dwihananto said. Medan police is currently questioning the suspect, 17-year-old Ivan Armadi Hasugian, to investigate the link. “[Ivan] confessed he did not knew anything about the man’s identity,” Mardiaz said. National Counterterrorism Agency (BNPT) chief Comr. Gen. Suhardi Alius told Beritasatu the suspect is only a “puppet,” as he is too young to have planned the attack by his own. “Considering his young age, there has to be someone else who supports him. We are currently digging to seek his identity,” Suhardi said. 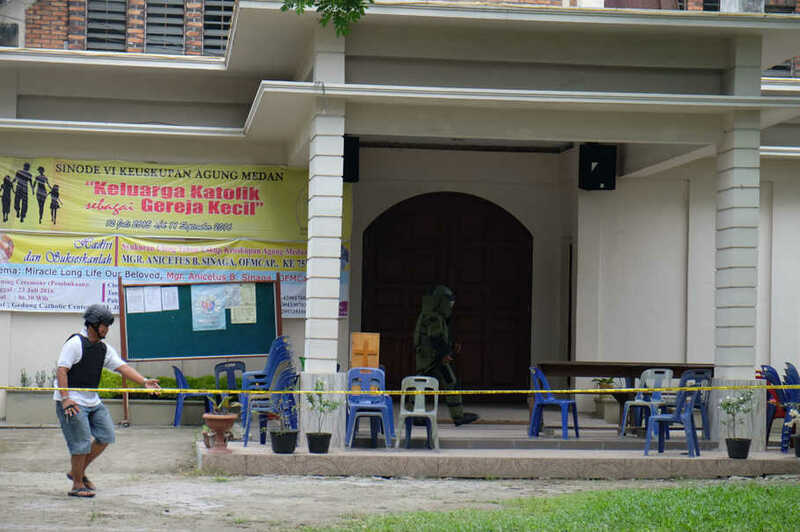 The failed attack occurred while Father Albert S. Pandingan led the Sunday service at Medan’s St. Yoseph church when the suspect ran towards to pulpit and attempted to kill the priest. The bomb hidden in the suspect’s vest failed to detonate, only creating sparks which injured the would-be attacker. The priest sustained only minor scratches to his arm and has been transferred to a hospital nearby the church. Members of the church congregation seized the suspect, who was carrying a knife, an axe and a pipe bomb in his backpack, before police arrived to clear and secure the venue. There are no major casualties in the incident. Jakarta. 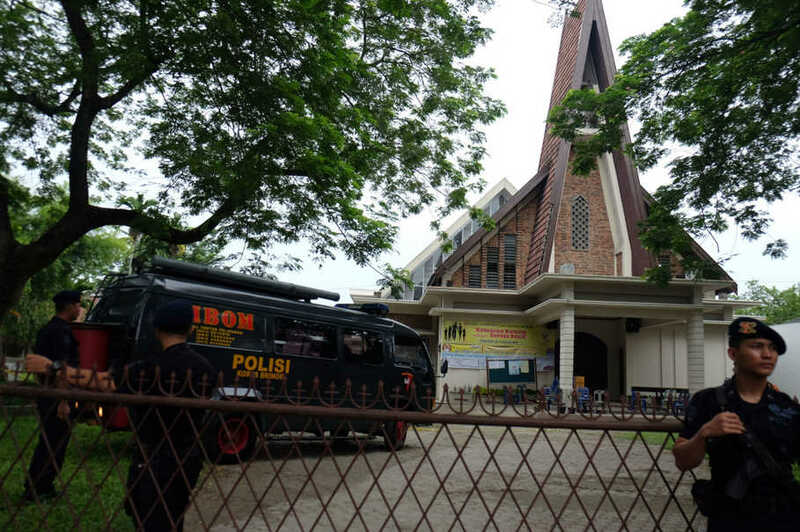 Police discovered an unexploded bomb in the backpack of a suspect who failed in a suicide bomb attack at St. Yosef Church in Medan, North Sumatra, on Sunday morning (28/08). The low-level explosion left the suspect, identified as Ivan Armadi Hasibuan, bloody and injured. Police arrested Ivan who revealed he is a student from Setia Budi, Tanjung Sari, Medan. The 17 year-old perpetrator was also reported carrying a graphic image similar to the Islamic State logo. Investigations into potential links to terror groups are continuing. The incident occurred while the priest delivered a sermon from the altar and Ivan ran towards him, throwing his backpack and creating a low explosion. Ivan also attacked the priest with a knife, but wounded only his arm before being subdued by members of the church congregation.